Sophomore guard Darrell Brown led the Braves with 12.6 points per game last season and was named to Missouri Valley Conference All-Freshman. 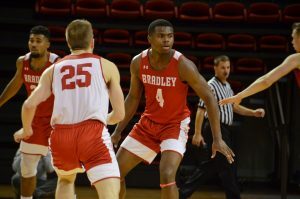 Bradley basketball sophomore point guard Darrell Brown and NBA legend Penny Hardaway share a unique connection. While Brown stands at 5’10” and Hardaway at 6’7,” the pair have more similarities than one would think. Besides being play-making point guards, they both hail from Memphis, Tennessee. Brown’s father, Darrell Brown Sr., actually grew up with Hardaway and formed a relationship that lasts to this day. 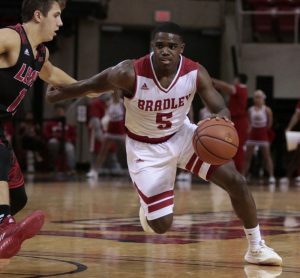 Hardaway is even the godfather of his Darrell Jr.
A member of the Missouri Valley Conference All-Freshman team last year, Brown had one of the best rookie seasons in Bradley basketball history. The point guard led the Braves with 12.6 points per game and finished with the highest average by an MVC true freshman since Doug McDermott in 2010-11. 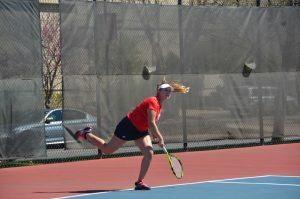 This year, the sophomore was the lone underclassmen named to the All-MVC Preseason Teams, collecting second-team honors. Brown credits his teammates for the accolade. 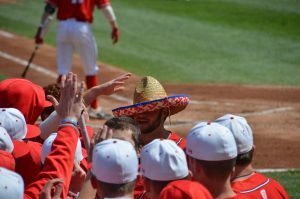 Once again Brown is expected to be the offensive catalyst for the Braves this season, and he said he is not backing down from the challenge and has his eyes locked on lofty goals. In addition to those team-oriented goals, Brown said he also has some expectations for himself this season. As the guard said he wants to be a force on both sides of the ball. To achieve these goals, Brown said he will be following the advice the NBA legend, and his godfather Hardaway gave to him.